These Banoffee Pie minis feature the superb combination of bananas and caramel with a bit of rum thrown in for fun. The base has sesame seeds for a little nutty kick. For sweet tooths only! 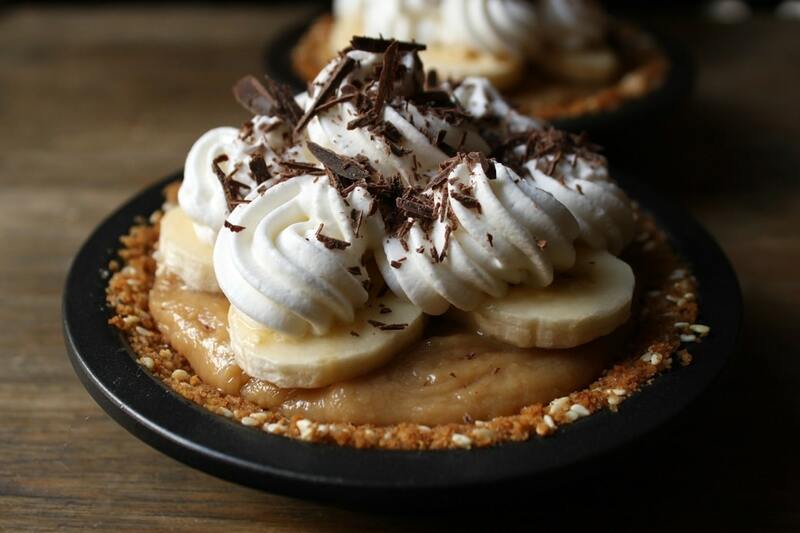 What is a Banoffee Pie? 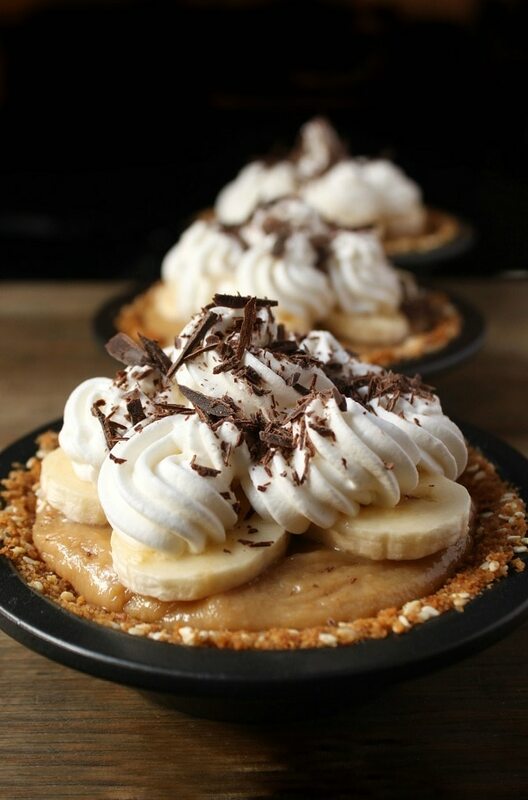 Banoffee Pies are delicious pies that start with a sweet pastry or pressed graham crumb crust. Graham crumbs are available at your grocery store but if you just have graham crackers go ahead and smash them up! 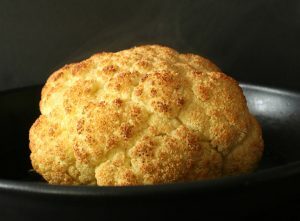 For this recipe, I also added some sesame seeds but you don’t have to. It really brings a unique nutty flavour to the pie. Next comes a layer of bananas. This layer can be single or thicker depending on how you build your Banoffee Pie. After the bananas, comes the caramel layer. 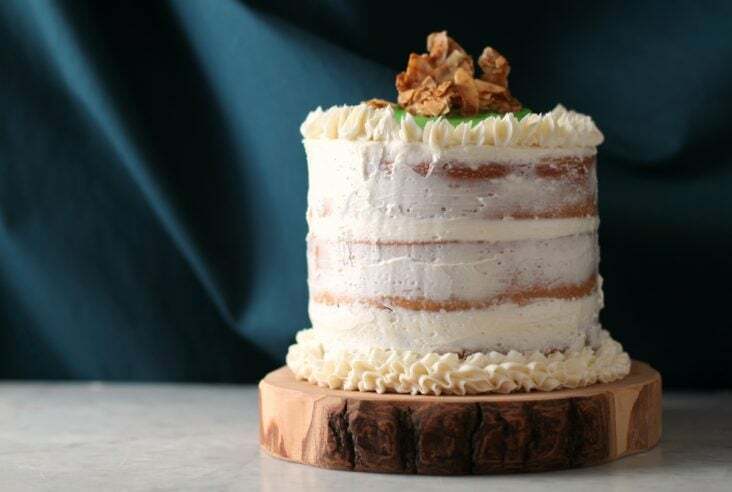 The caramel toffee layer must be solid enough to stand at attention after slicing but not too hard as to make the pie impossible to slice or awkward to eat. Lastly, there’s a layer of whipped cream. How much depends on you. Cover the entire surface or just enough to let the last layer of bananas poke through. 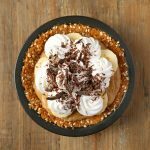 Where is Banoffee Pie From? Banoffee Pie originated in the United Kingdom around 1971. The pie has become popular among English Australians and more recently, in North America. Our family and more specifically, our youngest son fell in love with it when we lived in Australia. It became a regular birthday request in lieu of cake. Banoffee sounds like a crazy mish-mashed word and it is! It’s a mash up between Banana and Toffee. While this creamy pie filling isn’t technically toffee, it certainly hits all the flavour profiles.What’s not to love about bananas and caramel toffee? It’s one of those flavour combinations that just…belong. You know what else goes with bananas? RUM! Yep, I added rum to the caramel and to the whipped cream topping. Substitute vanilla for a non alcoholic version. This recipe uses a can of sweetened condensed milk. Technically both evaporated milk and sweetened condensed milk are condensed but only the latter has added sugar. It’s easy to confuse the two but your recipe will not turn out if you substitute a can of evaporated milk. Caramel Toffee or Dulce de Leche? I’ve made Banoffee Pie filling in a few different ways. Boil an unopened can of sweetened condensed milk on it’s side in a pot of water for 2 hours and you’ll end up with dulce de leche. This method produces more of a runny filling but it is ultra smooth and creamy. For this recipe, I combined butter, brown sugar, and rum then combined it with the sweetened condensed milk. It isn’t as creamy but it creates nice clean slices. Have you ever set a cream pie in your refrigerator only to find it turned watery overnight? Nobody likes watery whipped cream! The next time you need to whip up some whipped cream and have it last a few days, stabilize it. It’s pretty easy to do and you probably have the all the ingredients in your pantry. All it takes is a few tablespoons of icing sugar or cornstarch (or both, see recipe) whipped into the cream to make it last up to 3 days. These mini Banoffee Pies feature the superb combination of bananas and caramel with a bit of rum thrown in for fun. The base has sesame seeds for a little nutty kick. For sweet tooths only! Add the graham crumbs, sugar, sesame seeds, and melted butter to a medium bowl. Mix well until the mixture becomes crumbly. 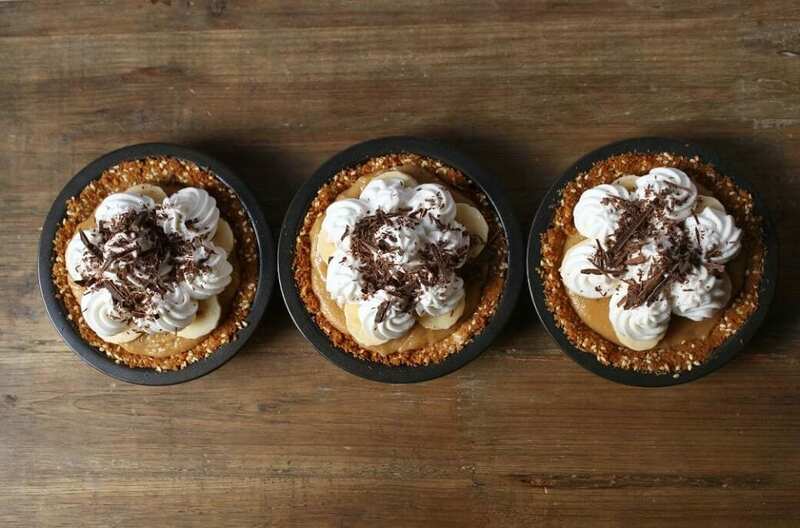 Divide evenly between 4 mini pie pans (or one large 9 inch pie plate). 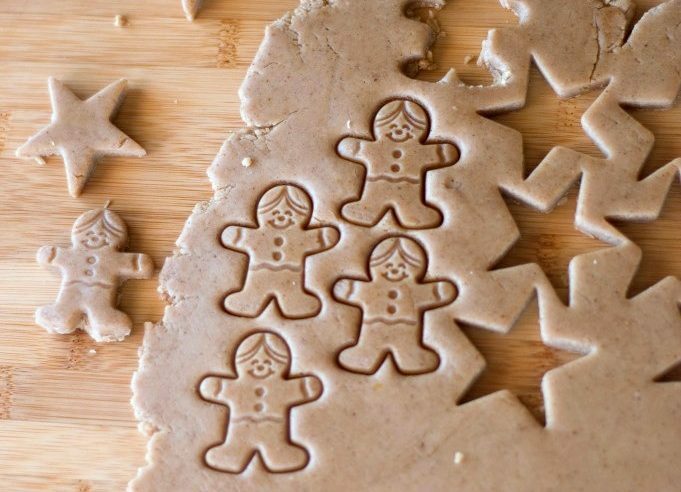 Press crumbs into pans using fingers, then take one mini pan and press it into the other crusts to pack them down further. Bake in a 350 F oven for 10 minutes. Remove and let cool. Combine the butter, brown sugar and rum in a saucepan. Bring to a boil and keep it there until it becomes foamy. Add the sweetened condensed milk and bring back to a boil, stirring constantly. When the mixture turns slightly darker (about 3 minutes), remove from heat. 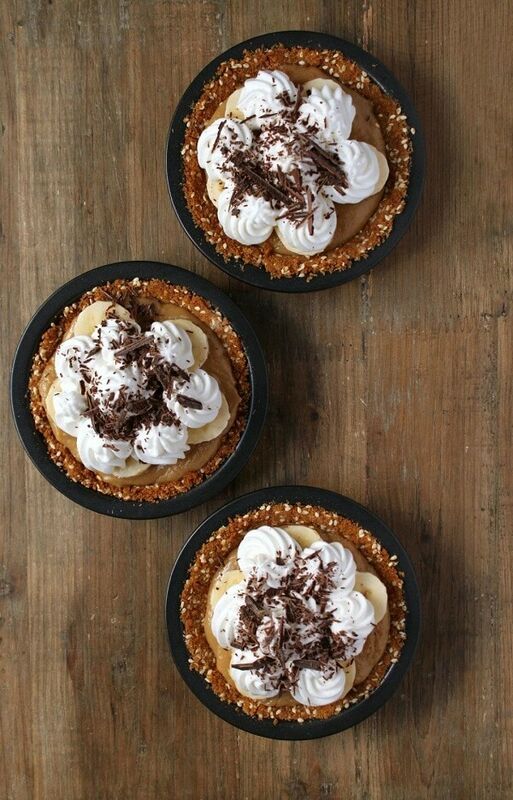 Slice some bananas** and place them in the waiting crusts, then pour the filling over all. Let cool. Pour whipping cream into bowl of stand mixer and begin whipping. When soft peaks appear, add the rum and continue whipping until the cream reaches stiff peak stage. Add another banana layer on top of the filling, then pipe whipped cream over all as desired. Garnish with shaved chocolate if you like. *this is one way to stabilize whipped cream. 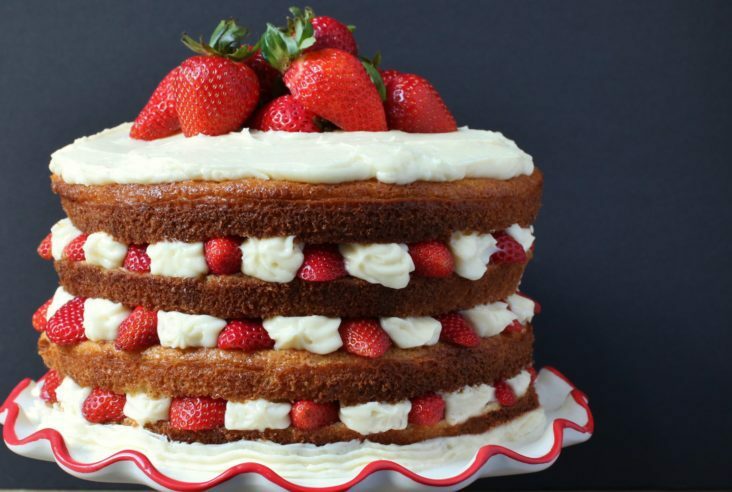 There are a few other ways but for home desserts that will be eaten within a few days, this is the best way to keep that whipping cream from liquefying. **you can have the bananas pre-sliced. Just sprinkle them with a bit of fresh lemon juice and lightly toss. This should prevent them from turning brown.